Works with Wayne Dalton model TS125, TS150, TS200, 5150 Thermomark, 5200 Thermomark, 5155 Thermomark, 5255 Thermomark, 2415, 2411, 216, 220, 451, 452, 8300, 8500. Overhead Door Thermacore models 591, 592, 593, 594, 598, 599 series 416, 418, 420, 422, 424, 426, 430, 432, 511, 521. Clopay models 520, 520S, 524, 524S, 524V, 525, 525S, 525V, 692, 652V, 3150, 3154, 3155, 3200, 3201, 3203, 3230, 3300, 3602, 3603, 3622, 3652, 902 Raynor TC200, TC300, TC320, Steal Form Optima, Standard and Basic, Aluma View. CHI models 3212, 3216, 3220, 3221, 3222, 3240, 3241, 3242. 3250, 3251, 3252, 3285, 3290. Also works with most Ideal, Midland, North Central, Amarr, Martin, Genie, Gadco, Garaga, Taylor, Industrial. 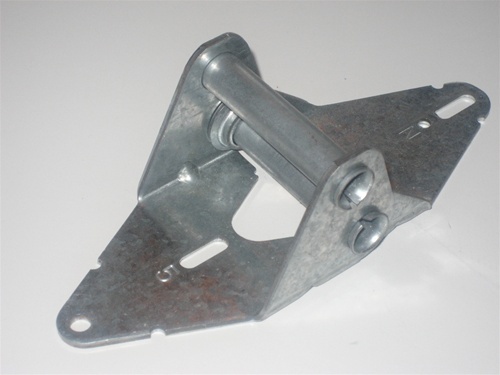 Identify your hinge by looking for the stamped number located on the face.